Following a rather dismal April which saw national home sales decline 13.9% year-over-year and the average sales price sink 11.3%, the Canadian real estate Association noted that much of the slowdown came in the province of British Columbia, in particular the Fraser Valley and Greater Vancouver. Across the province of BC, home to Canada’s hottest real estate market, which has seen home prices nearly double since encountering a small dip in 2008, there appears to be a rather noteworthy slowdown. Buyers have stepped to the sidelines following a barrage of housing policies aimed at cooling demand. Perhaps none more impactful than the mortgage stress test coupled with quickly rising borrowing costs. 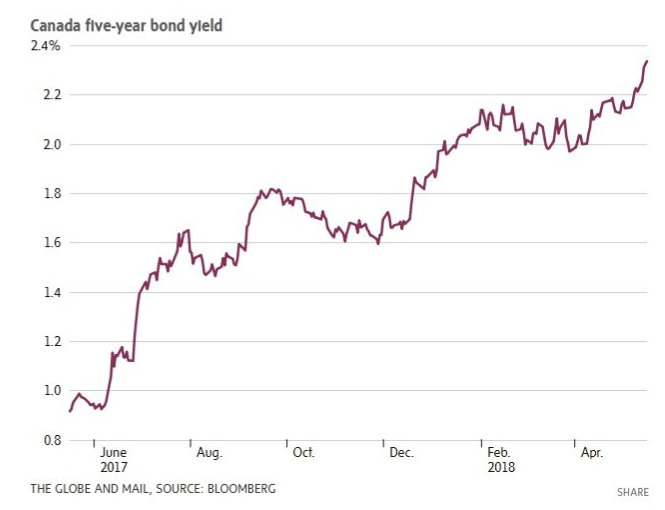 Amidst rising interest rates and inflation concerns, the bond market has sent prices tumbling and yields spiking, particularly in recent days. The Canada 5 year bond yield has jumped from .09 in May 2017 to 2.337 as of today. In lockstep, the five year fixed mortgage rate has seen it’s costs jump, with a typical mortgage now hovering around 3.5%, up from roughly 2.5% a year ago. It should come as no surprise that home sales across BC fell to a five-year low in April, dropping 17% year-over-year. 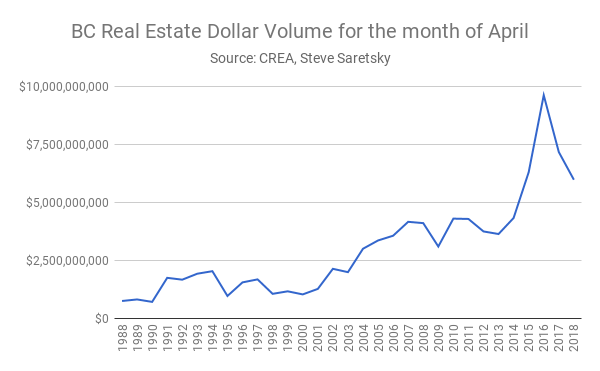 As such, with falling home sales and more cooling measures en route, expect the real estate market to be a drag on economic activity moving forward, despite a record high 55,000 units of new housing under construction. Total dollars spent on BC real estate fell 1.2 billion year-over-year last month. In fact dollar activity is down 39% from the April 2016 peak. 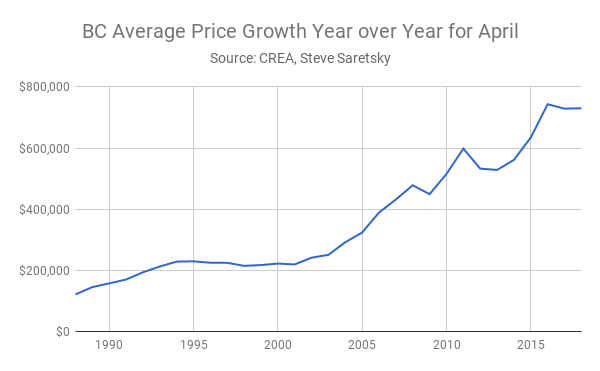 Meanwhile, the average sales price across BC showed 0% growth on a year-over-year basis, unable to eclipse its April 2016 peak. This is largely due to the sales composition switching from the detached housing to the more affordable condo market. However even condos have a threshold and we are beginning to see some pushback on condo prices in the city of Vancouver. To think this won’t translate to the rest of the province at some point in the near future is unrealistic.